The Witness must be the most painfully-analyzed game release of the past few years. Painstakingly-analyzed? Both. I haven't even gone looking for the discussion threads. They're out there, because we all love to talk. So I doubt I can say much. But (I love to talk) I will take a shot at the aspect I find most interesting, which is the game's presentation of its point of view. Your point of view? Both. You can't talk about The Witness without mentioning Myst, but The Witness has curiously little to say about Myst. "Curiously" because Braid, the designer's previous game, was an extended and careful riff on Super Mario Brothers. Oh, it was plenty of things beyond that. But the design of Braid reflected SMB in its art, its enemy design, its jumping mechanics, and its frame story of a lost princess. And this was not unreasonable, because SMB has (perhaps retroactively) assumed the mantle of a videogame archetype. So when I heard that Jon Blow's next game would be puzzles on a mysterious island, I said "Oh, he's doing Myst now." Myst is as much a videogame archetype as Adventure and Tetris. Taking apart Myst's conventions and assumptions won't necessarily make a great game (it might get you no farther than Pyst did) but it could be an excellent launching point. Well, as everyone informed me the minute The Witness launched, it's not Jon Blow doing Myst. He went off in other directions -- fine. (One could make the argument that it's more of a riff on Portal.) But we can still pick up the thread, because it is a first-person graphical environment, and the conventions of Myst's design loom over all such games. You are you; the game is your view of the world; you act by manipulating the world directly. These ideas were never perfectly implemented -- the original mouse cursor and 544-pixel-wide window strained to hold the illusion of being your hand and your eye. But the ideal seemed so obvious as to require no argument. The Witness, with due consideration and no explanation(*) at all, rejects each of these conventions. Not blatantly; you won't even notice at first. But they all fall apart upon inspection. A disagreement so understated and distinct must be deliberate, I think. SFWA, the Science Fiction and Fantasy Writers of America, has announced that game writers will soon be eligible to join. (The rule change goes into effect on August 1.) This applies to writers who work on videogames, RPGs, and tabletop games. SFWA is a professional society for SF writers (and fantasy, yes, and no you don't have to be American. The acronym is way out of date). Their membership page gives an overview of what they do: support and professional/legal advice for authors, particularly authors just starting out. Also a newsletter and so on. Also SFWA runs the Nebula Awards (the SF awards that aren't the Hugos). The notion of admitting game writers has been floating around SFWA for a while now. Last September they added Choice of Games to their qualifying markets list, and they've also reported that a broader rule change proposal has been in the works. Apparently it was voted in, so here we are. Sell a game containing at least 40000 words to a qualified (paying) market. Or sell three games of 10000 words to a qualified market. Or sell (to players) a game of at least 40000 words that makes at least $3000 in a year. Word count includes the narrative content, not instructions or game mechanics. To count, games must have a narrative element, be in English, and be SF, fantasy, or horror. Work done for hire is not eligible. Rambo notes that the rules are subject to further discussion and change (particularly on that last point). They're feeling their way forward on this. To compare, the SFWA criteria for prose authors are "one novel of at least 40000 words, or three short stories of 10000 words." Or screenplays or stuff of equivalent lengths. Or a self-published work that makes $3000. So these rules are a direct translation, with the caveats about game mechanics and work-for-hire. I don't know the story behind that. Brian points a finger at Greg Costikyan but I couldn't find discussion from that era. Anyway, it was long ago and no doubt the fannish furor has been forgotten. We'll see. In the meantime, I did a quick word-count and verified that, yes, I qualify for membership! 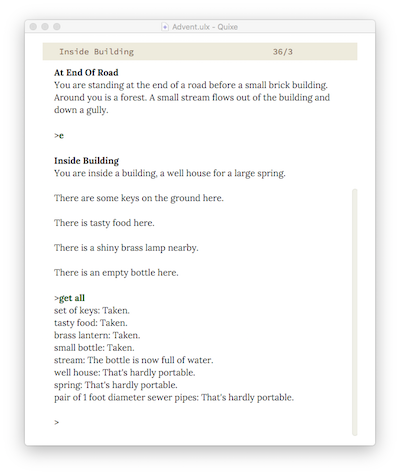 Hadean Lands has about 73000 words of displayable text (out of about 240000 words of Inform source code). For a more accurate number I'd want to discount credits, tutorial, and parser messages, but it will still be comfortably over 40000. And I have passed the $3000 minimum for a self-published work. So... I'm still thinking about this. The $100/year SFWA dues aren't high, but they're not completely trivial either. But, on the other hand, there are benefits. Plus I'm doing this non-profit thing; I want to keep a toe dipped into all the relevant professional circles, and SFWA now counts as one. And... there's a following-in-the-footsteps aspect which is awfully attractive. Today we are announcing the Interactive Fiction Technology Foundation (IFTF), a new 501(c)(3) nonprofit organization dedicated to supporting the software and services that underlie modern IF. For the past 25-ish years, IF has been primarily a free hobby supported by free-time volunteers. This is great; it's organized around a community (or communities) rather than being pinned to one company's fate. But it's also a weakness. People's free time varies. Services and tools go unmaintained. The goal of IFTF is to support these efforts; to provide an umbrella organization that can manage projects when the original creator doesn't want to; and to be a visible donation point for benefactors who want to support IF. Our first project involves assuming stewardship of IFComp, lending the event (and its website) the legal and financial backing of a formal organization. Jmac will still be in charge of IFComp, but he will now do it wearing an IFTF hat. And IFComp will now (through the parent organization) own its own web-site code and copyrights and so on. Our plans for the near future include support for Twine and doing a study on accessibility of existing IF tools. Beyond that, well, we'll have to see how much money comes in. We also have a large advisory committee drawn from across the various IF worlds. I could burble on about this project, because we've been swinging at it for several months and the ideas are flowing rapidly. But today's the day we announce it, so I'll stand back and let the news percolate. So I bought a Steam Machine. How did that go? PCs are a horrid swamp of choosing hardware parts with model numbers a mile long and people calling you an idiot for picking the wrong third letter. Plus, I don't want to maintain Windows. But they run all the games. Macs have a few easy-to-choose models, which is good, but they don't get all the games. Some of the games, but not all the games. Consoles have just one model (per decade) and run all the games. But I don't want to do business with Sony or Xbox (Windows). I've been getting along all-Mac for a long time. But, well, The Witness. And other cool-sounding indie titles. And then there's Obduction, which will be available for Mac, but... the recommended graphics hardware just isn't cheap on the Mac side of the universe. SteamOS looked like a tolerable compromise. It's not Windows. (I know how to maintain Linux.) But it's as cheap as Windows. There are too many models, but if I pick one brand it's only about four models and I don't have to read about graphics cards until my eyes bleed. I figured Valve was a big enough gorilla to corral the game studios into Linux/SteamOS support. Maybe not top priority, but some support. So, last winter I bought a Steam Machine. Alienware, one of the middle models, I don't remember the letters and numbers. It arrived in December. You can buy HL on Steam. That is the whole blog post. A few weeks ago Emily Short declared the Bring Out Your Dead game jam, an event dedicated to sharing our abandoned projects and failed experiments. The jam opened this evening; submissions remain open until the 24th. I see 31 entries already, including works from Alan DeNiro, Bruno Dias, Adri, Cat Manning, Sam Ashwell, and this honorable blogger. I said a year ago that Flashpaper would be my next IF project. And I still intend that to be true! I built these prototypes last year and demoed them in private; I showed a version at Boston FIG as well. But they just didn't work out, so I scrapped them and started from scratch. The start-from-scratch plan is still marinating. I have plans. They may even see daylight this year... but for the moment, enjoy these Flashpaper prototypes. I have posted a new release of Hadean Lands to my Humble Store and Itch.IO pages. 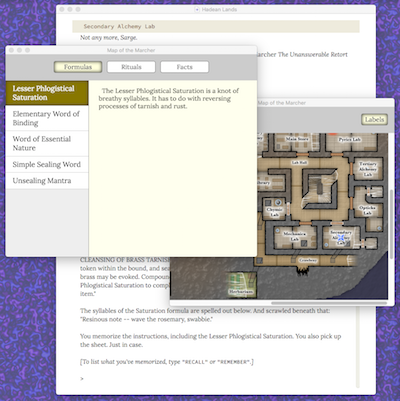 This is the new Lectrote-based app, for MacOS, Windows, and Linux, with autosave and integrated map and journal windows. Bug reports are very welcome. Any bug I fix before the Steam launch is a win. If you have saved games from the original (2014) release of HL, they are not compatible with this release. Sorry! I've stuck the original HadeanLands-2014.gblorb in the package too, so if you really want to go back to your old save files, it's possible. This means that you have three weeks to buy the new version of the game at the old price. Think of it as a secret preparing-for-Steam sale. Obviously, it's not a secret secret that the game is still available for $5. This is the Internet and you're reading it. But it's a fine line between "I underpriced HL when I originally released it" and "you're jacking up the price on us, you jerk." I don't want to get into that argument on the Steam store page for HL. My position there is "This is a $12 game." Keep it simple, keep it focussed on the Steam launch. If you've looked over the Steam store page you've probably noticed the DLC! Yes, Hadean Lands will have DLC, and no -- I'll spill the joke right away -- it's not extended game content. It's the Hadean Lands Solo Adventurer Pledge Certificate. That is, you can pay extra money for a certificate that you sign promising not to look at hints. Purely optional, I assure you. The certificate will only be available through Steam. I've put up a detailed explanation on the DLC page. So far, comments are running 100% for "clever idea"... okay, that's 100% of one comment. Still, a positive response. Might even make me some extra money. Today I posted the beta of Lectrote, a new IF interpreter application for Mac, Windows, and Linux. This is both more and less exciting than it sounds! Quixe had the UI that I wanted -- no surprise; it's the one I wrote the UI for! -- but it wasn't really meant to be used as an app. It exists as a web page, or a component of a web page. Also, it's slow. So I put it aside and went with Gargoyle. However, the long messy story didn't end there! A few weeks ago I was gazing over the endless cycle of dev-tools and noticed Electron. Electron lets you wrap up a Node.js tool as a standalone app for Mac, Win, and Linux. And Node.js is, well, I don't really know what it is but it's a web thing. Seems ideal, right? Stuff Quixe's web page into Electron and we're done. It wasn't quite that easy. Node.js has full filesystem access (unlike a web page), so I had to extend Quixe's load/save system to deal with ordinary files. (So you can exchange save files between Lectrote and other interpreters.) But that was still pretty easy. I stuck the IF postcard in a menu, too. And now you can try it. So what does this have to do with getting Hadean Lands onto Steam? Well, it's a very simple tweak to drop a Glulx game file into Lectrote. 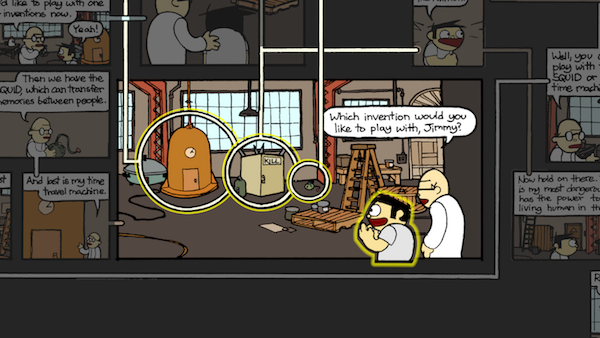 Then you've got a Mac/Win/Linux app that plays a single game. And it looks nice and the text layout is pretty and you can adjust the font size without editing a text file. I haven't done that yet. I'll have to adjust the menus -- knock out all the support for opening multiple games. More important, I'll have to add autosave. Right now, if you're playing a game and you close the window, your game is gone. Hope you typed SAVE! That's okay for an interpreter (used by IF habitués), but it's not ideal. It's really not acceptable for a Steam standalone game release. Autosave for Glulx games is a bit of a nuisance, but I got it working on iOS. I will get it to work with Quixe. It will just take a few more weeks. ...oh, and then there's the speed. I mentioned that Quixe is slow, right? It's faster than it was but it might not be fast enough for Hadean Lands. If you own HL for Mac/Win/Linux, try it! In particular, try loading a mid-game save file and typing a command which requires many stages, like GO TO BAROSY. Anyway, I may try plugging a different Glulx VM into Lectrote to speed it up. I can probably run RemGlk/Glulxe as a subprocess of the Node.js server... We'll see. For now, Lectrote is a multi-platform interpreter app which has the UI I want, and that's a good start. I am happy to report that Hadean Lands is this week's deal on IndieGameStand. For the next four days, you can buy my alchemical IF puzzle hit for -- for -- whatever price you want. Go nuts. High resolution map: This is the artwork that I used for the Hadean Lands backer reward poster. It is larger than the version included with the general HL release, and includes a few additional details. Hadean Lands source code samples: A few representative samples from the Inform 7 source code of the game. Critical Hit: An unfinished prototype of a game I started in 2009. This has never been released on the Internet, although I included it on the HL backer reward CD. 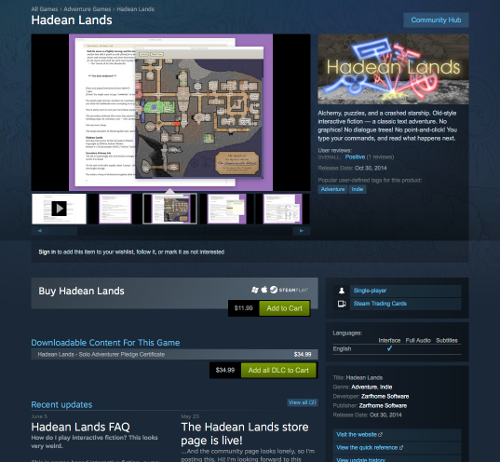 IndieGameStand is offering Hadean Lands for Mac, Windows, and Linux. These are exactly the same versions that are available on the Humble Store and Itch.IO. Play IF on iPhone or iPad? I've put the iOS version of HL on sale too! For the same period -- until Thursday. Or buy the bundle with Shade and Heliopause. Note: the iOS version is not pay-what-you-want; it's a flat $2. And it does not include the IGS bonuses listed above. The two sales are separate; sorry, I have no way to link them together. But you can buy both if you want, right? The Indie Games Festival nominees are now posted. The IGF is a showcase of indie games which exists as part of GDC (March, San Francisco, expensive). This year I was invited to be on the jury for Excellence in Narrative (along with Emily Short and some other folks you might know). As I understand the awards process, it's a three-phase thing. A large pool of game experts and designers nominate a large list of games, and then spend a few months playing and commenting on them. (The long list was over 750 games this year.) Smaller groups of experts then look at the top-voted entries on the long list and select six finalists. The final winners will be announced from GDC on March 16th. I was involved in phase 2, which meant playing a bunch of games (but like a dozen, not 750!) and then talking them over with the other folks on the narrative jury. I have permission to post my game notes (although not, of course, anything the other jurors said!) and that's this post. The finalists in the Narrative category were (in alphabetical order): The Beginner's Guide; Black Closet; Her Story; The Magic Circle; That Dragon, Cancer; Undertale. Congratulations to all of them! And to the finalists in the other categories, too. I was also invited to vote for the Seumas McNally Grand Prize, but I declined. I don't feel I've played enough games this year to have a sense of what's best overall. I had enough trouble squeezing in the time to play the Narrative nominees! I had access to free review copies of all of these games. (Pre-release copies, in the case of unreleased titles.) I had already purchased (and played) Her Story, Sun Dogs, and The Beginner's Guide on my own account. I wrote these comments in the order that I played the games. Except for Her Story, Sun Dogs, and The Beginner's Guide, which I wrote up pretty much when they occurred to me. See also Emily Short's post of comments about the voting process. My voting criteria were... well, Emily's post has a good list of points: mechanics that support the story, observant writing, and substance. I care about all of those things, but it's an extremely subjective process. I certainly didn't give a finely-graded point-based score to each game. I also didn't simply vote for my favorite games. Obviously my preferences color everything! But the audience here is people who follow indie gaming, not just me, so I tried to keep that in mind. In the end, I tried to pick the games which will make gamers say "Holy crap, games are even more narratively awesome than I thought."